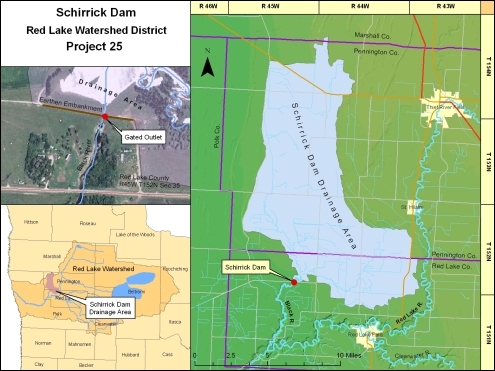 Schirrick Dam is located on the Black River in Section 35 of Wylie Township in the northwest part of Red Lake County. This is about 20 miles northeast of Crookston, MN. The drainage area of this facility is 107.7 square miles. The primary purpose of this structure is to provide flood relief on the Red Lake River and the Red River of the North by controlling the flow contribution from the Black River. A small permanent pool upstream of the dam provides benefits for nearby property owners. The Schirrick Dam consists of an earthen embankment with a maximum 38 foot height and a gated concrete outlet structure. The reservoir, designed to store up to 4,800 acre-feet of water, maintains a permanent pool storage of 70 acre-feet. Operable components are stop-log bays to control the elevation of the permanent pool and hydraulic flood gates to control the flow contribution of the Black River during floods. The gates will normally be open and will close only in the event of severe mainstem flooding. The Schirrick Dam was completed and made operational in 1985. The cost of construction at that time was approximately $1,019,000.